Saint-Gobain Abrasives has launched a new line of centerless grinding wheels to its bonded abrasives portfolio. The newly developed Norton Century45™ centerless bond platform features an exclusive chemistry that greatly improves grain retention in the wheel. Better grain retention means wheels are constructed with more porosity for a given hardness. This translates into wheels having a hard grade with the performance of a softer grade, providing a range of benefits. 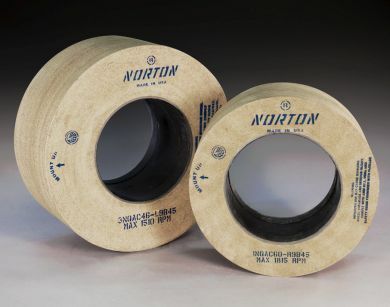 Norton Century45 wheels are available with ceramic, aluminum oxide, silicon carbide grain and abrasive blends to maximize user grinding safety and efficiency. These wheels reduce cycle times by up to 50 percent, improve stock removal by over 30 percent and increase wheel life from 30-100 percent versus standard products currently on the market. Norton Century45 provides a continually sharp wheel face that achieves over 30 percent more stock removal, reducing grinding times through fewer passes to achieve optimal results. Operators will generate more parts through reduced production cycle times when using Norton Century45 wheels. Norton Century45 centerless grinding wheels also can decrease grinding noise levels by as much as 23.2dB, even when grinding hard-to-grind alloys such as Inconel 718, thus increasing operator safety. To put this noise reduction in context, many commercially-available foam ear plugs offer Noise Reduction Ratings in the range of 25 to 28dB. Norton Century45 is ideal for bar grinding, fastener and tool grinding, automotive or aerospace components, as well as bearing applications. Whether in a high production grinding facility or job shop, Norton Century45 can significantly reduce grinding costs while increasing safety and production throughput.